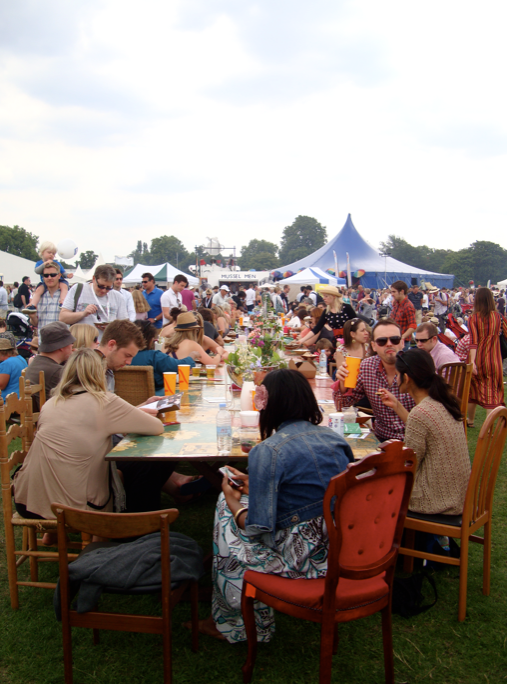 Last Sunday I went to the Big Feastival on Clapham Common, London. Jamie Oliver masterminded this weekend of food and music with all profits going to charity. 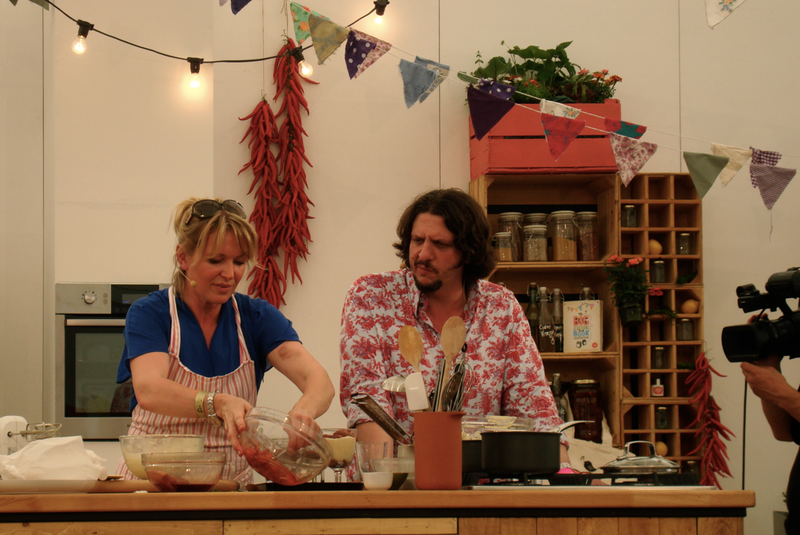 I also saw some great demonstrations by Giorgio Locatelli, Matt Tebbutt, Rachel Allen, Willie Harcourt-Cooze, Gennaro Contaldo, Jay Rayner and, of course, Jamie Oliver himself. I learnt a lot and they were all engaging and amusing to watch. While I was there I picked up a copy of the cookbook they produced to go with the Feastival. It has a great collection of recipes from some of the participating chefs. After a bit of deliberation, I decided to try this recipe by John Murray of Vinoteca. I haven't made many multi-component desserts so this seemed like a good challenge. 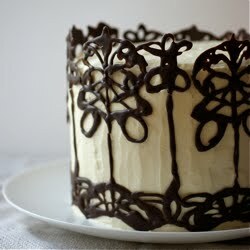 If it helps this was the order I made it in: the ganache and creamy chocolate, which went in the fridge to cool. I made the coconut crunch mix and then the crumble while it chilled. I took the creamy chocolate out of the fridge to come to room temp. Then I baked the coconut crunch, turned the oven up and baked the crumble. Finally I assembled it. The balance of this dessert is great - so many contrasting and complementary textures and flavours. 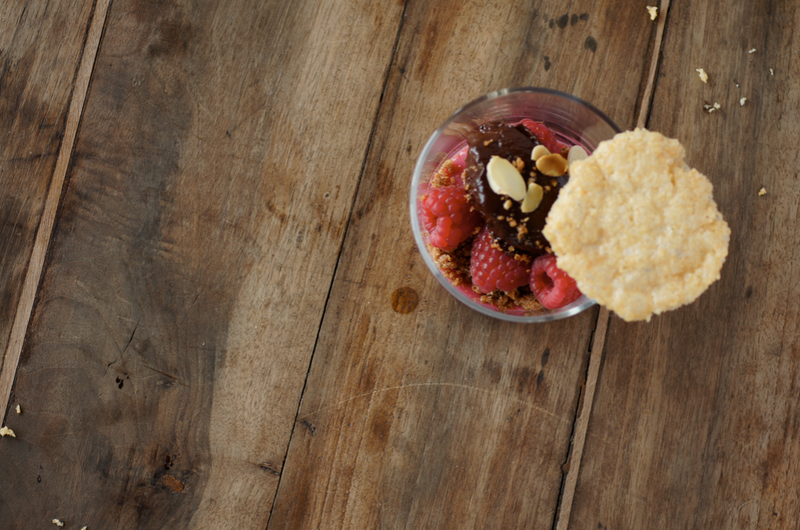 The raspberry cuts through the rich chocolate and the various crunches from the coconut and almond round it out. It's an exciting dessert to eat. Chop the white chocolate up into small chunks and place in a small bowl. Press the raspberries through a fine sieve into a small saucepan until you only have the seeds remaining. Scrape down the bottom of the sieve so you don't loose any juices. Heat the raspberry juices until boiling. Take off the heat, wait 30 seconds, then pour over the white chocolate. Stir until smooth then cover and place in the fridge. Chop the chocolate up and place in a small bowl to one side. Whisk the yolk and the sugar together in another small bowl and set aside. Place the double cream in a small saucepan and heat until just starting to boil and then take off the heat. Pour a small amount into the egg bowl, whisking as you go. Scrape the egg mixture back into the saucepan and whisk to combine. Put back over a medium heat and use a spatula to stir and scrape down the mixture until it has a custard consistency. Pour over the dark chocolate and stir until smooth and glossy. Put in the fridge until 1 hour before you want to serve. Cream the butter, sugar and salt together until light and fluffy. Stir in the milk then fold in the coconut and flour. Place into the fridge to rest for 30 minutes, meanwhile preheating the oven to 150C. Spread the mixture into circles or teardrops of about 3mm thickness - it should make 8. Bake for 12-15 minutes or until lightly browned. Set onto a wire rack to cool until needed. Cream the butter and sugar together until light and fluffy. Fold the almonds, flour and cocoa in. Roll into a log, wrap in cling film and place into the freezer for 30 minutes. When nearly ready to serve grate the log onto a lined baking tray. Spread out and bake for 8-12 minutes. Leave to cool for 5 minutes. 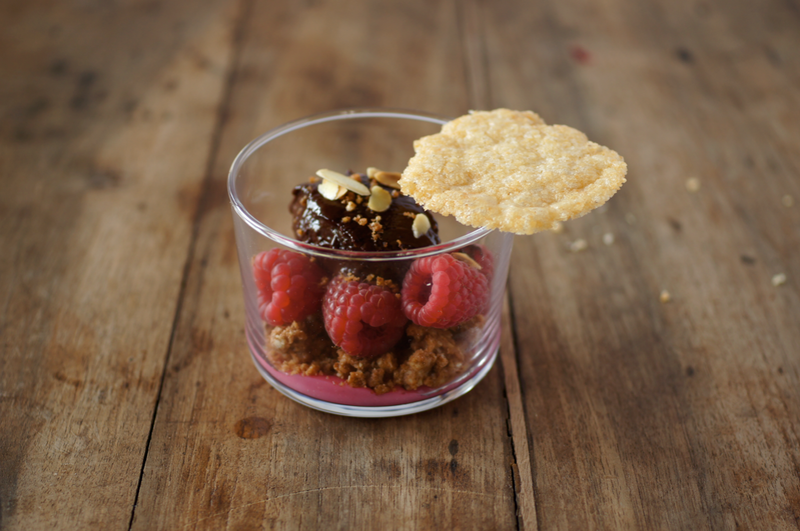 Divide the raspberry ganache into four and spread into four ramekins or small glass bowls. 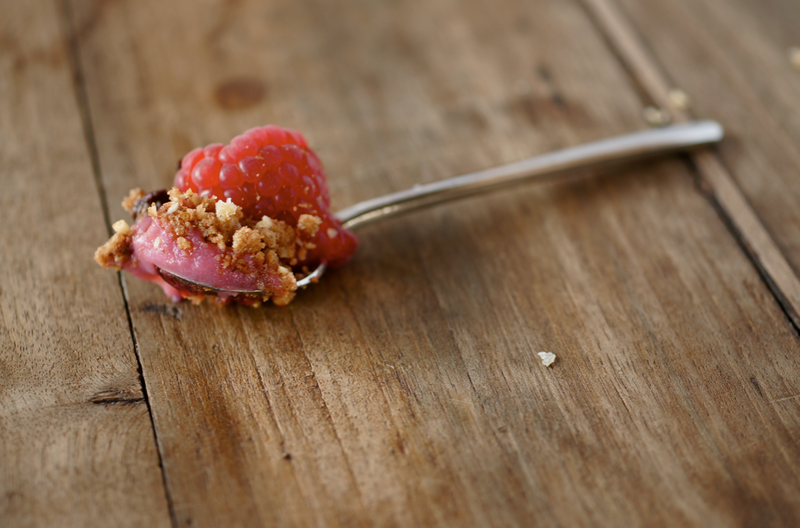 Sprinkle over 1/4 of the crumble, followed by 4-5 raspberries. Heat one or two spoons (whichever you are more comfortable with) in some hot water, then create four quenelles from the room temperature creamy dark chocolate mix. As you go place each one on top of the raspberries. Sprinkle the flaked almonds over the top and place one or two coconut crunches on top or to the side. so yummy....the crunchy part is what i like the most ! This looks so delicious! Thanks for sharing. Ooh lovely recipe. Feastival looks like it was fun! Velvet - pleasure, glad you enjoyed it! Emalina - thanks - it was fun, a good day out. Feastival! What a brilliant idea, I can only hope it comes to Australia one day. I like desserts with raspberry! Wonderful!